Wow! It’s Day 19 of the 90 Day Transformation Challenge. Now. Your assignment for today (should you choose to accept it) is to think of your weaknesses. Go ahead and write down a list of them. Next. Find the strength in it. I seem to have ADD. I can never focus on one thing for very long. I somtime find myseelf a bit crticial of my inconsistency in my projects. I get Hot for one and then it kind of cools and I move to the next project and so forth. I never seem to just finish one thing at a time. I’m good at a LOT of different things. I have also written 500 songs. I’m a songwriter BECAUSE I have a 3-6 minute attention span! And as an artist, it’s REALLY, REALLY GOOD to have lots of different interests and influences because it makes my work better. 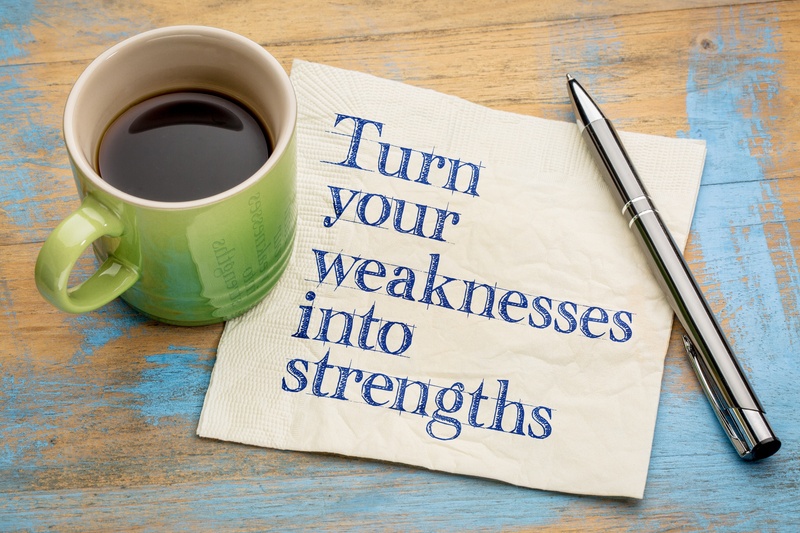 Just remember to START with the WEAKNESS… and flip each piece of it into it’s corresponding STRENGTH. Dive deep with this. Let me know what you come up with OK? p.s. the NLP technique is called a “reframe.” NLP is a Wide Awake Form of Hypnosis and Hypnosis is YOU communicating with your Unconscious Mind in a way that gets you the results you want. Faster. Easier. Better.